The two brothers were arrested and executed by the Romans under Diocletian. Cecilia was arrested soon afterwards and was condemned to be suffocated. This failed to kill her and so the Romans had her beheaded. 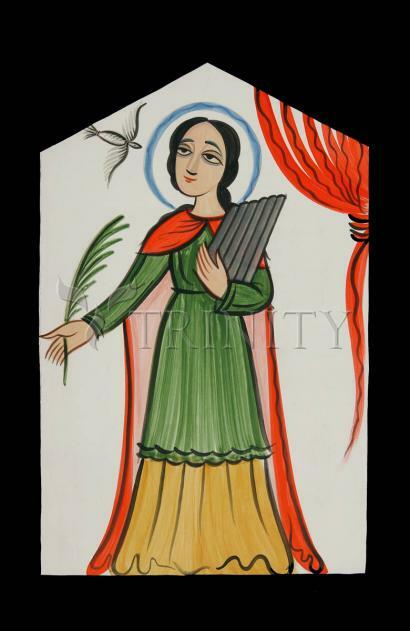 In sacred art Cecilia is often shown holding the palm of martyrdom and playing a musical instrument such as the organ or violin. The name of Saint Cecilia has always been most illustrious in the church, and ever since the primitive ages is mentioned with distinction in the canon of the mass, and in the sacramentaries and calendars of the church. Her spouse Valerian, Tiburtius, and Maximus, an officer, who were her companions in martyrdom, are also mentioned in the same authentic and venerable writings. Saint Cecilia was a native of Rome, of a good family, and educated in the principles and perfect practice of the Christian religion. In her youth, she, by vow, consecrated her virginity to God, yet was compelled by her parents to marry a nobleman named Valerian. She converted him to the faith, and soon after gained to the same his brother Tiburtius. The men first suffered martyrdom, being beheaded for the faith. Saint Cecilia finished her glorious triumph some days after them.